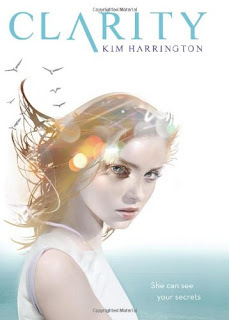 Clarity is an awesome debut offering from Kim Harrington. I whizzed through it in a matter of hours and was totally hooked throughout. Clarity is a teenage psychic who has been asked to help solve a murder mystery which quickly becomes very complicated when her older brother is arrested as the prime suspect. For me the best thing about this book was its pace. It kept me hooked in and reading page after page because things kept happening. I loved that I didn't have the time to get bored but also wasn't so continually rushed that I didn't think I didn't have the time to get to know the characters. I loved how to story twisted and turned and I was continually guessing in a bid to solve the murder, then getting wrong and having to rethink the whole thing again. I really enjoyed getting to know Clarity, the main character of the books. She is an outsider and someone who has never quite been cool enough to fit in at high school. I liked how she saw the world and how she related to her eccentric family. The murder mystery in this was good. As I said before it kept me guessing but I also enjoyed that the final reveal and the explanations for what happened were quite realistic and the way in which they were solved were too, even with Clarity's special abilities. I can't say I was all that fussed with the love triangle of this books. While it didn't irritate me I didn't really find that I liked either of the boys so wasn't really fussed about what Clarity did or did not get up to with them in the end. I really hope they are developed more in future books. All in all a nice quick read which was very enjoyable and both a nice start to a series but also a satisfying standalone in itself. It all sounded so good until you said the romance element of it is a bit of a letdown :( That makes me not so eager to read it.. But gosh, the cover is pretty.